Another bread recipe 🙂 This time, in the form of delicious bread sticks. A few weeks ago, I posted a recipe of Walnut Pesto. I had made a large quantity, to try and use up the abundance of basil in my freezer. I froze much of that pesto into individual servings. With guests coming over for a pasta dinner (recipe tomorrow), I like to serve a homemade bread. 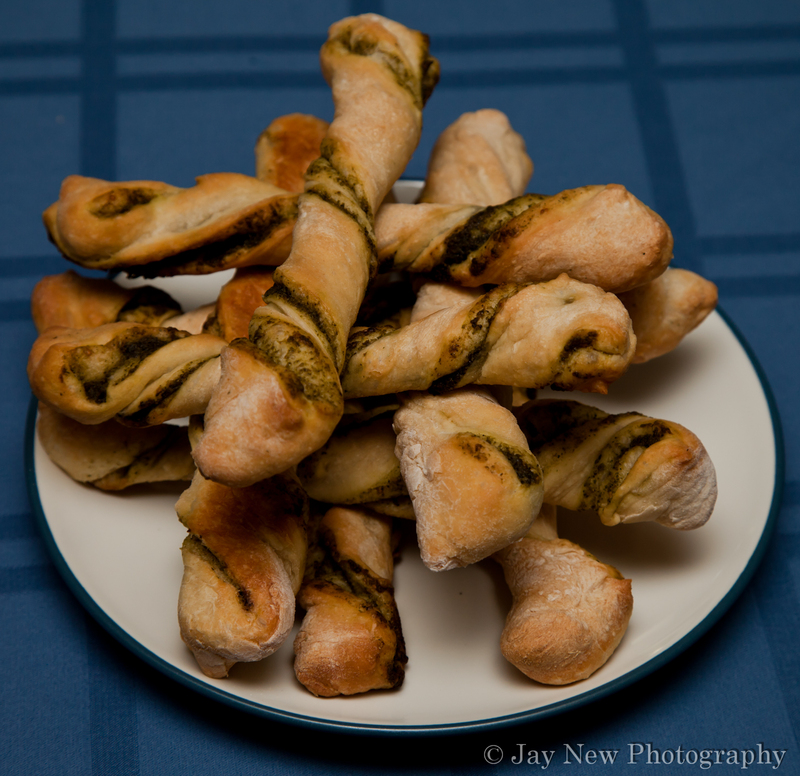 I decided that it would be a perfect opportunity to make bread-sticks using some of the pesto. Bread-sticks bring about another childhood memory for me. My father used to randomly suggest we go to a nearby pizza restaurant (his favorite one) and have dinner. We ALWAYS order the same thing. Two orders of Parmesan Bread sticks and one medium pizza is plain with just cheese and sauce and one medium pizza with onions, mushrooms and bell peppers…..olives, if we were feeling fancy. Yup, that is our standard order with varying drinks. I loved the bread-sticks, especially dipped with marinara. It was one of my favorite memories of those dinners. The only thing I would mention about this recipe is to watch the bake timing. If you are making thick bread-sticks, the bake time will be increased and thin bread-stick, lowered. Mine ended up a tad over cooked for my tastes. Combine flour, yeast, salt and olive oil. Roll out dough into a rectangle about 1/2 inch thick. Let dough rise for 30 minutes to 1 hour. What a good bread stick to pair with pasta! Those are perfect for an Italian meal. Love this recipe. And they look pretty too. Thank you 🙂 Wow, I just posted this up!